انتراكتيڤ فيكشن (انجليزى:interactive fiction) (بالعربى: أدب تفاعلي), ده سوفتوير اللى بيستعمل اللعيب اوامر تكست (Text) علشان بيتحكم فى الكاراكتر او تآثير على الوسط, الشغل ده بيعرف انها آدب روائ, وده برضه من نوع ادڤانتشر, او لعبه تمثيل اداء الادوار, ودى بيكون مواجهه تكستيه ادا ببتفاعل مع اللعيب عن طريق الكتابه بالكيبورد. ↑ تكست بالمصرى (Text), يعنى كتابه نصيه. ↑ Montfort, Nick (2005) . "The Independents". Twisty Little Passages: An Approach to Interactive Fiction. Cambridge, Massachusetts: The MIT Press. p. 196. ISBN 978-0-262-13436-1. 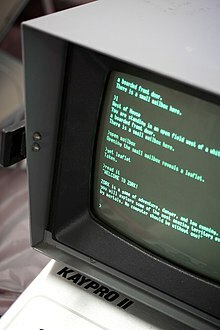 Some special-purpose interactive fiction development systems were used by the ordinary home computer owner of the 1980s. An important early one was Donald Brown's 1980 freeware system Eamon, a system for creating text-based role-playing games... Eamon was used to create more than 240 games.